My obsession with Superdrug’s vitamin E range is no secret. So far, I have reviewed and loved (or at least liked), Superdrug Vitamin E SPF 15 Moisturising Day Cream as well as Superdrug Vitamin E SPF 15 Radiance Moisture Cream. Superdrug Vitamin E Hydrating Mist (150ml for £2.99) is another own brand product worth looking at. This was my first purchase of a “mist” as I am rather sceptical towards such products. I don’t believe you need a “mist” but I can now most definitely see why so many love and use such products. 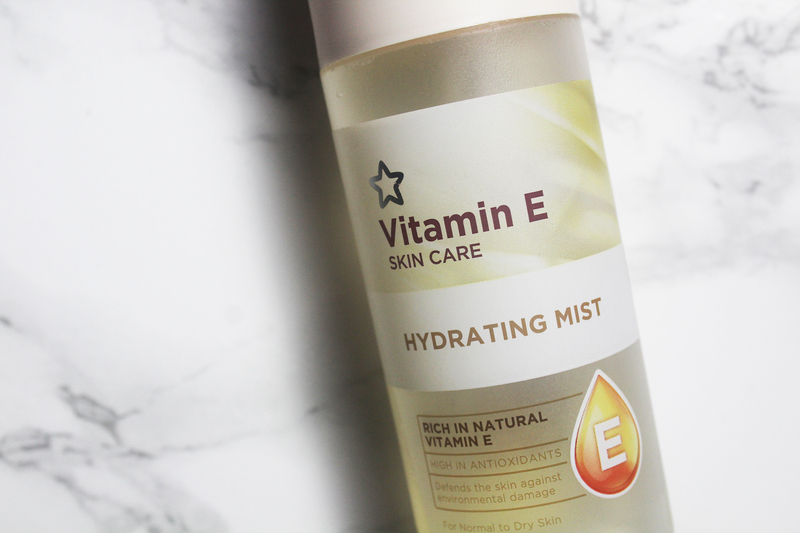 Rich in natural vitamin E and high in antioxidants (according to Superdrug), Superdrug Vitamin E Hydrating Mist is formulated to “defend skin against environmental damage”. Hmm. Superdrug also claims this mist prevents premature ageing whilst revitalising as well as toning. I am quite impressed with the words used to promote this mist. However, is any of it true? Is it worth investing in? I don’t know; I guess so. I like it but I know I don’t need it. 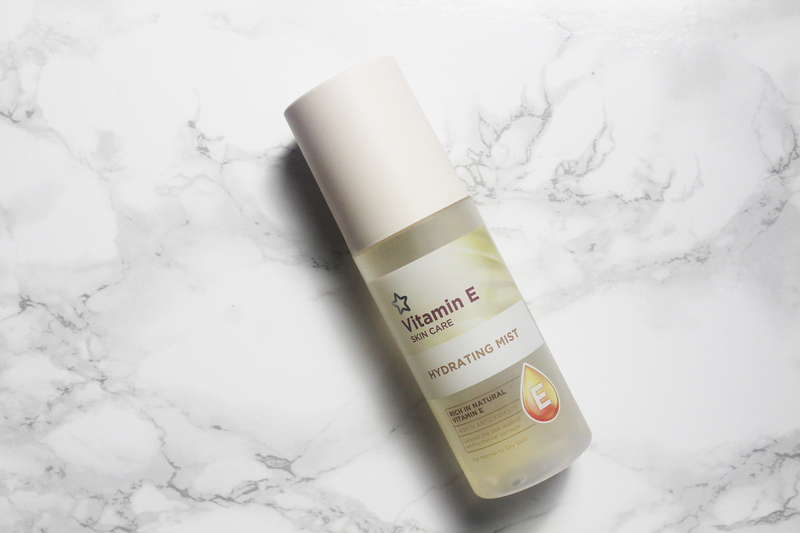 I have been using Superdrug Vitamin E Hydrating Mist all year. I rarely used it in the summer but during winter I found myself constantly misting my face and neck. I have oily skin (and I wear makeup) so I cannot reapply my moisturiser. 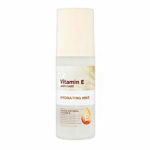 Superdrug Vitamin E Hydrating Mist is a great alternative, if you are in need of a quick and effective moisture boost. It applies evenly and lightly. The scent is also much suited to its purpose; it is nutty but pretty light. 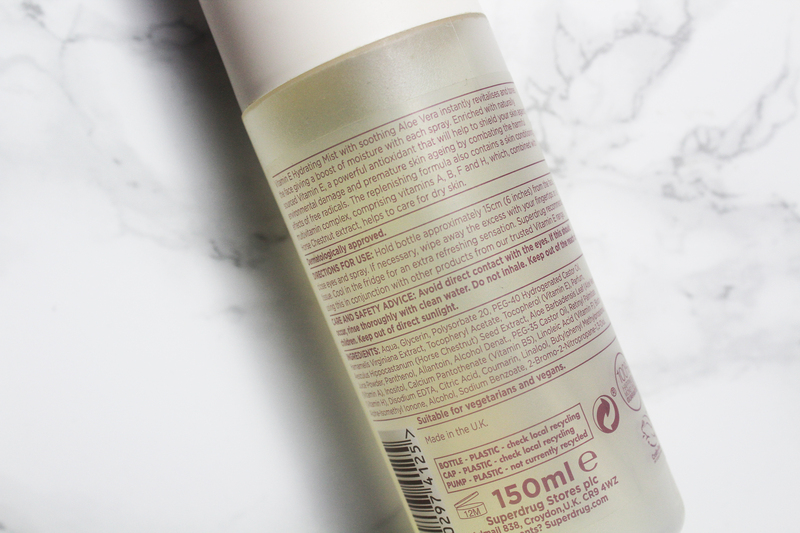 Superdrug Vitamin E Hydrating Mist leaves my skin super soft and residue-free. It also doesn’t interfere with my moisturiser or makeup. I also like to spritz my face with Superdrug Vitamin E Hydrating Mist before I retire to bed. This has helped my skin tremendously, especially during fall, throughout cold winter nights. Overall, I like it a lot but it is not a necessity!